Mix the 00 flour, yeast, oil, salt and water in a bowl to form a sticky dough. Knead until smooth, this should take approximately 10 minutes. Add a bit of flour if it is too sticky. Shape the dough into a round and leave to rise in a clean bowl, covered with a tea towel. When it has doubled in size, after 1 hour, transfer in a lightly oiled shallow baking tray, press the dough with your fingers, Cover again and leave to rest in a warm place for 30/45 minutes. Pre-heat your oven to 220C. 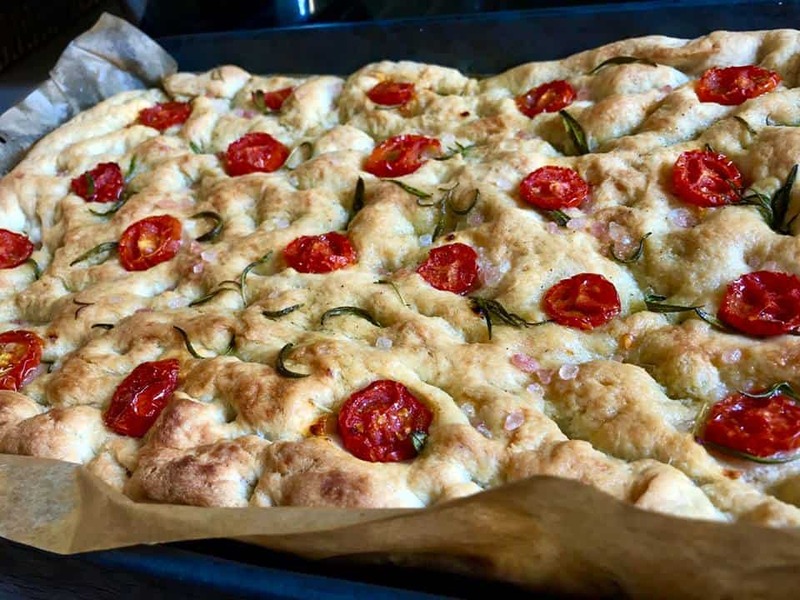 When the dough has oubled in size add some extra virgin olive oil over the surface using your fingertips, add the cherry tomatoes and sprinkle with salt and rosemary. Bake for about 25/30 minutes or until cooked through. Serve warm and enjoy!